The Intex Explorer 200 is a multipurpose inflatable boat that can be used from playing around at a pool to coordinating a water attack in airsoft. In addition to the boat, an air pump, two oars, a repair patch, and a small piece of rope are included. The Explorer 200 is made up of two air chambers; one is the actual boat, and the other is the floor. This just means that instead of inflating the whole big thing, you inflate the two chambers separately. It also means that if one of the chambers popped while you were on the water, the other staying inflated should give you enough time to make it back to land before you sink. 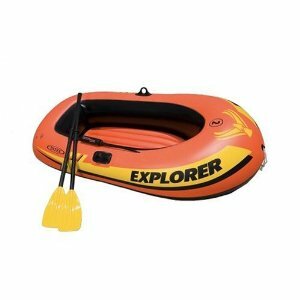 For a $15 inflatable boat, the Explorer 200 is pretty rugged. I wouldn’t suggest putting it in the ocean or down whitewater rapids, but it can easily stay afloat in a lake or river, even in rough conditions. Even hitting submerged stumps or grinding it into land doesn’t seem to damage the hull beyond some cosmetic streaks. Although, frequently running into rocks will tear a hole in the boat very quickly. The hull itself is very thin (barley thicker than a few pieces of paper), making it fairly light weight to carry on land, but like I said, with the exception of rocks, it can withstand just about anything. The air pump that comes with the Explorer 200 is actually really good. It’s a “Double Quick” pump, which means that it pumps air both when you push the pump and handle towards each other and away from each other, cutting the time to fill the raft in half (it still takes a good 10-15 minuets of constant pumping to get both air chambers fully inflated, though). The pump is made up of two parts also; the pump itself and a rubber hose that you attach to the end of the pump. The pump is about a foot long and is made of plastic, but is still very durable. The Explorer 200 is a perfect choice for those that where thinking of using it in airsoft. You can use it for a variety of things including transporting gear across water, attacking a enemy players base camp from the water, and much more. It has a 210 pound weight limit and is only barley big enough for one person, so you should be careful not to overload it, although I’m confident that you could have upwards of 215 pounds in the boat at once and be okay. Also, the Explorer 200 can operate in less than a foot of water without getting run aground, which is great if you need to get close to shore or over a sand bar. In case you are under attack, any BBs that hit the boat under 350 FPS should just bounce right off; although anything over 350 FPS might be getting a little close to penetrating the boat. The boat does come with a repair patch, but it’s only about 2 inches long and 2 inches wide, making it ineffective in patching bigger holes. It you do suffer a major gash to the boat, try pasting superglue all around the hole and then stick several overlapping layers of duct-tape over it. The only weak link is the oars. They’re made up of five parts each; two rods, a paddle, a connecter to connect the two rods, and a rubber circle that you slide onto the end of one of the poles to keep the whole ore from falling through the oarlock that’s fixed to the actual boat. All the parts just screw together and are 48 inches in length. The part that’s the “weak link” is the connecter (no pun intended :)). If you paddle to hard then it will simply snap apart. A easy fix to this is to wrap the connecter in a duct-tape several times, just to give it some reinforcement. The last thing worth noting is the actual performance of the Explorer 200. If you paddle fast enough you can get some real speed (between 5-10 MPH, and in some cases more). It also has very nice handling, easily twisting between stumps and rocks. The only thing is that you have to sit backwards in the boat, so you have to twist around to see where you’re going. In a wrap, the Intex Explorer 200 inflatable boat is a really great product for the $15-$20 that it runs. It’s easy to inflate, hard to sink, and has great handling. It’s relatively small, but it gets the job done.